A lot of us in the Apple world are more than a little miffed with Apple dropping the ball on the AirPower charging pad. A year ago, we all thought we’d soon be in a future where we could drop AirPods, iPhones and Apple Watch onto a surface and have them all quickly charged up. Well, until that day comes — if it ever does — at least we have products like the HyperJuice Wireless Charging Receiver (US$49.99), which works with your AirPods charging case and any 5W Qi wireless charger to bring truly wireless charging to AirPods. The design of the HyperJuice is actually quite simple. 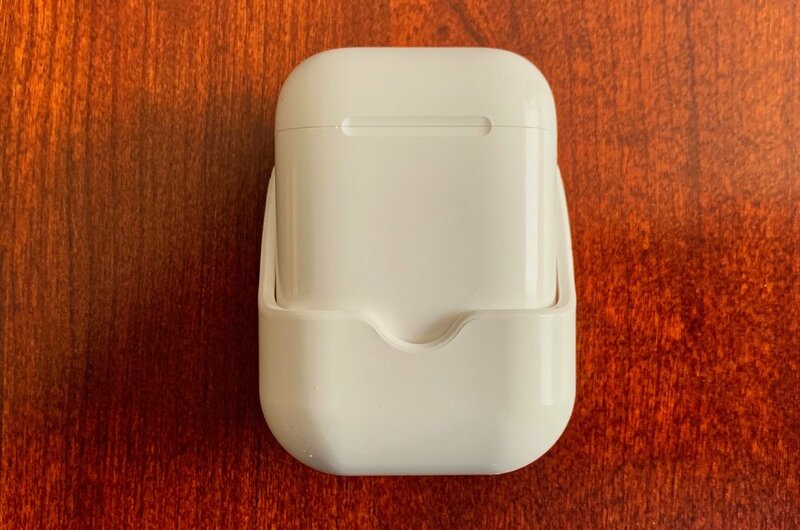 It’s a white plastic “sled” just a little bit larger than the AirPods charging case, with a Lightning connector in the bottom and an LED to show when charging is taking place. HyperJuice is an exact match to the AirPods charging case color- and finish-wise, and the case simply slides in and secures itself with a click. To charge the AirPods, the user just lays the combined HyperJuice and AirPods charging case onto a Qi charging pad, and the case is fully charged in 1.5 hours. It’s always nice when a product works as advertised right out of the box. It took about a second to slide the AirPods charging case into the HyperJuice, and once it was placed on a Qi charging pad, the bottom LED turned green to indicate that charging was taking place. I’m now just keeping the HyperJuice next to my wireless charging pad so that when I want to get a charge, I slip the AirPods charging case into the HyperJuice and drop it on the pad. For those who don’t carry their AirPods charging case with them, you can just keep the HyperJuice installed on the case all the time. My only complaint about the HyperJuice Wireless Charging Receiver is the price; sure, $49.99 is less than the proposed price tag for the AirPower pad, but you need to also have a Qi wireless charging pad to make this work. Hyper’s parent company, Sanho, gets a “A” for the quality and design of the HyperJuice, but a “F” for pricing. Something like this shouldn’t cost more than $25, and there are a number of other manufacturers selling virtually identical units for $20 - $30.